Col. Jonathan Byrom and Command Sgt. Maj. Adam Nash uncase the colors of the 3rd Cavalry Regiment "Brave Rifles" during a transfer of authority ceremony in Baghdad, Iraq, May 28, 2018. The Brave Rifles assumed the mission from the 3rd Brigade Combat Team “Patriots,” 10th Mountain Division, and will support the Combined Joint Task Force – Operation Inherent Resolve, working by, with and through Iraqi Security Forces and coalition partners to defeat ISIS in designated areas of Iraq and Syria. BAGHDAD — The 3rd Cavalry Regiment “Brave Rifles” from Fort Hood, Texas, officially assumed the mission from the outgoing 3rd Brigade Combat Team “Patriots,” 10th Mountain Division, from Fort Polk, Louisiana, during a ceremony held May 28, 2018. The transfer of authority was part of the regular rotation of forces that support the Combined Joint Task Force – Operation Inherent Resolve. The Brave Rifles support the CJTF-OIR by working with and through Iraqi Security Forces and coalition partners to defeat ISIS in designated areas of Iraq and Syria. 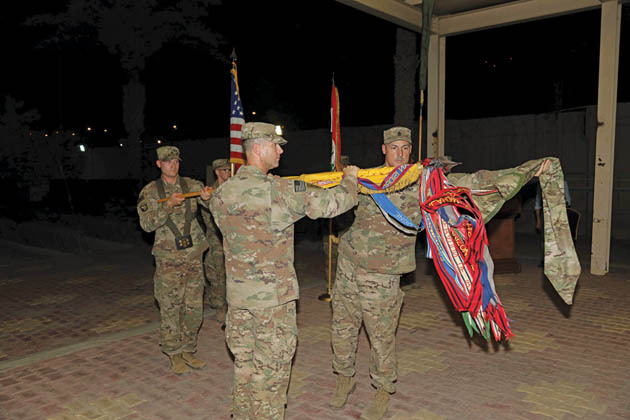 “The Iraqi Security Forces are a professional fighting force,” said Maj. Gen. Walter E. Piatt, 10th Mountain Division commanding general and Combined Joint Task Force – Operation Inherent Resolve deputy commanding general. “They deserve professionals to help them refine their fighting skills as the Brave Rifles now join the climb,” said Piatt. The Brave Rifles troopers will work alongside coalition partners and support Iraqi Security Forces as they continue their fight to defeat the last remnants of ISIS, providing security to the Iraqi people and setting conditions for follow-on operations to increase long-term regional stability. Troopers from the regiment have been replacing Patriot soldiers of the 3rd Brigade Combat Team, 10th Mountain Division, who were spread throughout the area of operations where they supported the Iraqi Security Forces conducting missions to defeat ISIS. After casing the Patriot colors, Col. Brian Sullivan, commander of 3rd Brigade Combat Team, 10th Mountain Division, reflected on the successes of the past year. “I’d like to congratulate staff Lt. Gen. Abdul Amir and the joint Iraqi Security Forces for their incredible victories over the past nine months,” said Sullivan. “From the military defeat of the Daesh caliphate to the persistent destruction of its remnants that provided for the most secure national election since 2003, the Iraqi Security Forces now stand among giants, achieving victory for their country and for the world,” said Sullivan. As the Patriot soldiers completed their hand-off to the Brave Rifles, Piatt looked forward to the road ahead, addressing the 3rd Cav. Regt. command team directly. “Your mission, your duty, is to build upon this professional army through reliable partnership. 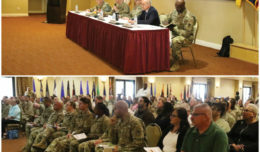 We are all equal – professional warriors helping professional warriors,” said Piatt. 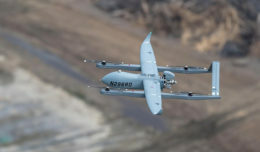 Brave Rifles squadrons underwent over six months of preparation and participation in Decisive Action Rotation 18-04 at the National Training Center at Fort Irwin, California, before additional training on providing security to partner forces, security force assistance, strike operations, and other key tasks to prepare them for their advise and assist roles. 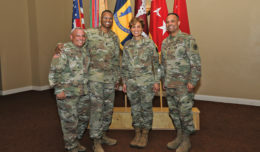 “The entire 3rd Cavalry Regiment looks forward to serving with you and your team of leaders. Thank you for welcoming us into Iraq during this exciting time. We are here to enable you and the Iraqi Security Forces,” said Col. Jonathan Byrom, 3rd Cav. Regt. commander. This is the regiment’s sixth deployment to Iraq, with participation in Operation Desert Shield/Desert Storm, Operation Iraqi Freedom and Operation New Dawn. The regiment last deployed to Afghanistan in 2016 to conduct an advise and assist mission to support the Afghan National Defense and Security Forces. “It is an honor for Task Force Rifles to join the Iraqi Security Forces as it continues to fight Daesh and secure Iraq’s borders,” said Byrom. The regiment recently celebrated its 172nd year since being formed May 19, 1846, and continues a long tradition of answering the call of the nation to deploy, fight and win anywhere in the world.